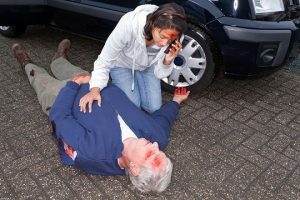 In the event of an accident often one of the fist things to do is call for help. Today the most common way of contacting emergency services is using a mobile phone. As we all know sometimes that is not as simple as it should be, perhaps there is no signal or you need to use someone else’s phone and you do not know the PIN. In this situation 112 is number well worth knowing. 112 connects you directly to the emergency services – police, ambulance, fire brigade, mountain rescue or coast guard. 112 works throughout the UK, European Union and some 70 other countries including USA, Australia and India. When calling 112 a mobile phone will connect on any network available and will prioritise your call if the network is busy. Calls to 112 by-pass the security PIN on the phone and will work even if there is no credit on the phone. On many phones the call will work even if there is no SIM card. Text messages to 112 may get through even when the signal is low or the network jammed – you need to pre-register to do this. This short video helps to explain further details of how to maximise your chances of getting help in an accident or emergency. This article was added on Wednesday, January 14th, 2015 at 9:12 am and is categorised under General News, Traffic Accidents, Workplace Accidents. Both comments and pings are currently closed. Error: Error validating access token: Session has expired on Saturday, 09-Mar-19 13:12:58 PST. The current time is Thursday, 25-Apr-19 05:52:08 PDT.